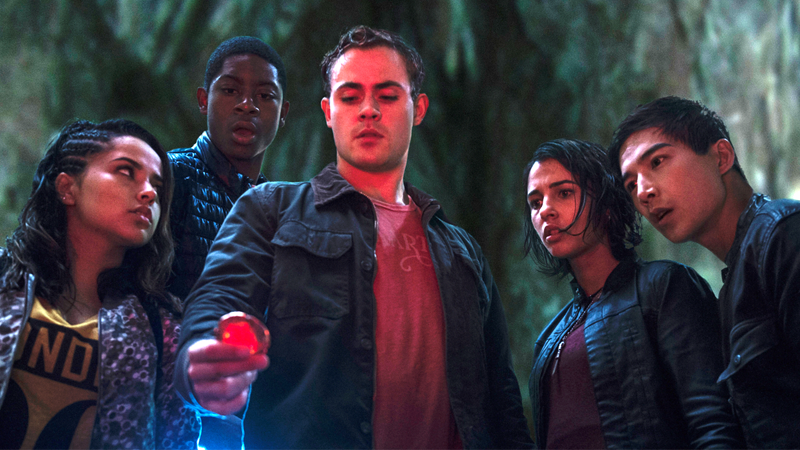 In addition to the release of reviews for the Power Rangers movie this week, it’s also been revealed that the film has become the first mainstream superhero movie to feature a main character who happens to be LGBTQ. It’s a big step for superhero cinema, but a question remains—just exactly how big is it? According to a brief new interview with director Dean Israelite for The Hollywood Reporter released yesterday, the film’s version of Trini (a.k.a. the Yellow Ranger, played by Becky G) is questioning her sexuality. The scene, from the film’s second act, is brief: The Rangers are all sitting around a campfire, discussing their various teenage problems. When Trini is asked about her issues, she says her family doesn’t get her relationships, at which point Billy asks her, “Boyfriend problems?” Trini dismisses the question, only for Billy to ask, “Girlfriend problems?” Trini doesn’t reply at all, citing that she doesn’t like labels—and then the movie moves on, tacitly acknowledging that whatever the character’s sexual preference it’s perfectly fine and normal. For Trini, really she’s questioning a lot about who she is. She hasn’t fully figured it out yet. I think what’s great about that scene and what that scene propels for the rest of the movie is, ‘That’s OK.’ The movie is saying, ‘That’s OK,’ and all of the kids have to own who they are and find their tribe. I’m conflicted about this revelation. Well, not the revelation itself, mind you. In fact, given the infamous history Power Rangers itself has behind the scenes with the way that David Yost, the original Blue Ranger, was treated horrendously by crew members on the show for being openly gay, it’s more than welcome. But for what is actually an incredibly important step forward in the representation of diverse characters in superhero cinema, and how long it’s taken, it feels disappointingly small. The scene is a bit of a double-edged sword. It’s certainly good that Power Rangers treats its LGBT character with respect, and the matter-of-factness with which sexuality is mentioned briefly and not commented on, shows that Trini’s homosexuality is perfectly normal and just a facet of her life beyond being a putty-punting, costumed scifi superhero. It’s a normalization treated in the same manner heterosexual relationships are, in that they exist as completely normal aspects of life. But at the same time, the moment is so brief, and so matter-of-fact, that it feels like Power Rangers movie may also want to be sweeping it under the rug as quickly as possible. Again, the film does not overtly confirm Trini’s homosexuality; it’s only the director who has confirmed it, and only this week. Whatever he asserts, the scene’s perfunctory vagueness could easily be seen as Israelite hedging his bets by some people. That’s obviously a very cynical way to look at it, but the scene could have resulted from this motive just as easily as it could have resulted from a desire to portray Trini’s sexuality with such matter-of-factness. Heck, maybe it’s both. The superhero movieverse has come a long way in its representation of a diverse roster of heroes since the early 2000s and X-Men 2's “Have you tried not being a mutant?” scene (although some of its biggest steps, in terms of putting non-white and non-male heroes in leading roles, are still yet to come). In fact, superhero television has come even further, especially with LGBTQ representation, thanks to characters like Sara Lance on Legends of Tomorrow, Curtis Holt on Arrow, and the ongoing arc surrounding Alex Danvers on Supergirl. For such a pivotal moment in the history of the mainstream superhero movie boom, that’s taken so long to get to, this scene being so minor—and apparently not even fully explicit in its intent—seems like a half step. Especially so on the back of the recent hubbub about LeFou in Beauty and the Beast’s “explicitly gay” scene being nothing more than a dance with another man at the end of the film. Moves like this and Power Rangers’ scene feel like the big movie studios are willing to pay lip service to LGBTQ characters, but not go nearly far enough in the manner they’re willing to treat heterosexual ones. It is fantastic that, in Power Rangers’ Trini, we now have an LGBTQ hero in a major superhero blockbuster. I just wish that it hadn’t taken until Power Rangers to get here, in such a slight way.